When Eames (Tom Hardy) said "You mustn't be afraid to dream a little bigger, darling" in Christopher Nolan's Inception, it may have seemed like little more than a throwaway quip, but that no longer seems to be the case. Nolan seems to have adopted it as a personal credo, since that sentiment is all over his latest project, Interstellar. Nolan returns to science fiction with a story that leaves dreams, Gotham and the Earth itself behind for the far reaches of space. It sends a small group of scientists, and audiences, on a journey that involves intergalactic travel, wormholes and a crisis that threatens to destroy all of humanity. It's epic filmmaking on a galactic scale, full of wonder and ambition, but the bigger canvas brings Nolan's flaws into sharper relief. In the semi-near future, the Earth has been ravaged by a series of "blights" which have destroyed almost all crops. The remnants of human civilisation survive while being pelted by perpetual dust storms, and the energies of the entire world are expended almost solely on farming. All other pursuits have been forgotten. Space travel is a distant memory, so much so that all school textbooks have been redacted to say that the Moon Landings were faked. Why worry about the stars when there is so much wrong on Earth? It turns out that the last hope for humanity lies among the stars. As Professor Brand (Michael Caine) tells former NASA pilot-turned-reluctant farmer Cooper (Matthew McConaughey), human life is doomed on Earth. The blight will eventually destroy all remaining crops, and it will also make the atmosphere too nitrogen-rich to sustain human life. Unless a solution is found, humanity will be wiped out within a generation. Brand's solution is to send a team comprised of his daughter (Anne Hathaway), Cooper and two other scientists (David Gyasi and Wes Bentley) through a wormhole and into another galaxy. Their mission to to visit a number of potentially habitable worlds. Once they have determined if any of the worlds can sustain life, the planet will form the basis for a new colony. Meanwhile, Brand will try to figure out how to send the rest of humanity out on space stations so that they can follow. Since no one has ever written a story about space travel where everything goes absolutely swimmingly, things don't quite work out the way that everyone hoped. Interstellar is a bold, ambitious and personal piece of filmmaking, and it's hard to imagine anyone other Christopher Nolan getting it made. It's visually stunning, in part because it uses CGI to effectively create the wormholes and black holes that pepper the narrative, and because the film makes extensive use of models and location shooting. It's one of the many ways that the film hearkens back to an older form of science fiction storytelling, particularly in the way that it consciously echoes 2001: A Space Odyssey. Some of those nods are quite clever - such as the way that TARS (voiced by Bill Irwin), the sarcastic robot that goes along on the mission to help the crew, resembles the Monolith from Kubrick's film more than it does any other cinematic robot - while others - such as the film's third-act shift into metaphysics - suffer by comparison. 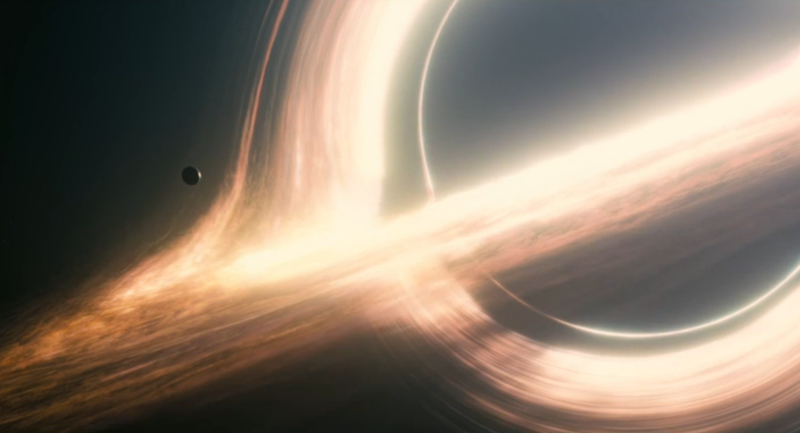 Where Interstellar comes unstuck, as is so often the case with Nolan's work, is in its human elements. Or rather, in the way that it awkwardly tries to mesh its human elements with its scientific ones. Nolan, who co-wrote the script with his brother Jonathan, has a great handle on spectacle. He knows how to stage a fight scene on top of a glacier, or how to wring every bead of tension out of a scene in which the crew have to evade a huge tidal wave on a planet covered entirely by water. However, when the film consists of characters talking to each other, the dialogue often becomes needlessly techie and the characters become little more than mouthpieces for obscure scientific theories. Trusting the audience to figure everything out is one thing, but it's hard to get invested in the drama if it's not entirely clear what the characters are doing or what the stakes are. It's especially odd considering that Cooper is the layman who gets roped into the mission at the last minute, yet the other characters either don't explain things to him (and, by extension, the audience) or, when they do, they do it at times that kill any momentum the film builds up. There are times when Interstellar acts like it is a thoughtful and meditative story about the great unknown beauty of the universe, in which people feel a secular awe at the vastness of it all, and there are others in which it becomes a very silly action movie, complete with Bond villain-esque monologues. Other characters, such as Cooper's son Tom (played as a child by Timothée Chalamet and as an adult by Casey Affleck), are so thinly written and so obviously exist as nothing other than obstacles to other characters that they might as well have been replaced by locked doors or tall walls. All of that could be pushed aside if the emotional core of the movie was stronger. Nolan is often pegged as a cold and analytical director, a label which I don't think is particularly accurate. Inception is an overwhelmingly emotional film about one man trying to come to terms with his grief over the death of his wife, and while its dreamworlds and actions sequences are very elaborate, they are in service of achieving a relatively simple and pointed emotional impact. Interstellar, by contrast, has that elaborate construction, and uses its emphasis on psychics to create a potentially moving situation in which Cooper's daughter Murphy (played as a child by Mackenzie Foy and as an adult by Jessica Chastain) ages more than 20 years while her father remains the same age, but the simple emotional connection isn't particularly well handled. McConaughey and Chastain do their best to sell the concept, but it's ultimately too heady to be compelling. It doesn't help that Nolan uses the same cross-cutting he used in Inception to try to bridge the two stories, but does so in a way which just blunts the momentum of the two separate strands, rather than interweaving them to create a more powerful thrust. Christopher Nolan should be commended for creating a film as intelligent and thoughtful as Interstellar, and for making a science fiction epic which owes as much to Ken Burns' The Dust Bowl as it does 2001, but his ambitions do not and should not excuse shoddy writing and weak characterization. It's an odd mixture of spectacle and introspection that is never wholly convincing as either, and ultimately ends up as dry as the dust that covers everything on Earth. If time is relative and an hour on that water planet lasts seven years, then watching Interstellar certainly feels like it lasts 18 or 19 years.